Once she gifted me with an elegant wallet. It was black leather with golden clasps. I thought it very handsome, but I was a mere teenager and didn’t feel comfortable accepting it from an elderly lady. But she insisted I take it. And being Sylvia Mandelbaum, she won her point. She nearly always did… She was a determined person. Spunky too. She fell in love with Gush Katif when on a tour there at an advanced age (“my age is nobody’s business but my own”) and moved there. In the early days, while her villa was being constructed, she lived in a caravan adjacent to my family. And she determinedly brought back floor tiles for her house in order to move the building process along quicker. She had a fascinating history. Since I know I won’t possibly do it justice, I’m quite reluctant to even try. She started by designing shoes. She told me that she was very good at it. But she didn’t remain at that job. She married, she had children, she moved to California (for the climate), she was a real estate agent, later she made Aliyah and she also wrote many articles over the years and authored books. She also introduced Gishur (divorce by mitigation) in Israel which is quite a feather in her cap. I’m convinced I don’t know all of it. Despite my willingness to listen, she wasn’t one to dwell much on the past – she was interested in the present. She listened to the news and kept herself up to date. And when the Disengagement Plan first breathed air she was very worried as to the future of the nation, and as to her own future. She had reason to be. When I first started writing articles she insisted on reading them. She told me I was lucky; that I had discovered very early in life where my talent lay. And to my great embarrassment, she insisted on my autographing for her every article I wrote. 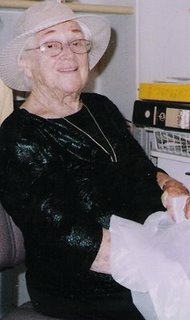 Mrs. Sylvia Mandelbaum has passed away today. It is three years to the expulsion of Neve Dekalim. She was buried in Jerusalem at 3:30 this afternoon in Har HaMenuchot, at the entrance to Jerusalem. And what remains to me are memories of an ardent Zionist and independent thinker. She was certainly an activist and a doer in her lifetime. And I continue to fondly use the wallet. Shifra Shomron is the author of the historic novel, Grains Of Sand: The Fall Of Neve Dekalim, (Mazo Publishers, 2007). This entry was posted on August 14, 2008 at 11:04 am	and is filed under Gush Katif. You can follow any responses to this entry through the RSS 2.0 feed. You can leave a response, or trackback from your own site. I met Sylvia only a few times, but as everyone did in Gush Katif, we all knew her. I’ll never forget her three-wheeled bicycle with large basket and “Rolls Royce” license plate. And how she forced the big Sephardic green-grocer to speak to her in ENGLISH! I can’t imagine that anyone else did, but Sylvia, z”l, was Sylvia. Among the many sins of the Expulsion Government they will have to pay for making the last three years of Sylvia’s life a great hardship instead of a contented life surrounded by loved-ones. Arab terror never phased her, not even the mortars. It was the expulsion that broke her heart and must have taken years off of her life. Thank you Shifra for writing in her memory. Hadassa: your comment invoked other memories in me. I recall that when a bullet had made a small indentation into the exterior of Sylvia’s (cement) house, she was almost excited. The chances of a bullet reaching her villa neighborhood were slim, and it was incredible that once covering this distance the bullet had enough power to make an indentation into her wall. Sylvia viewed it as a novelty and showed the bullet in the indentation to all her visitors… When it fell out she was disappointed and had it put back in. It has been brought to my attention that Sylvia OBM was 92 and a half at her passing. She was born the seventh day of Chanukah.